Walking Boulder's "Living Lab" on Folsom Street: What Works? 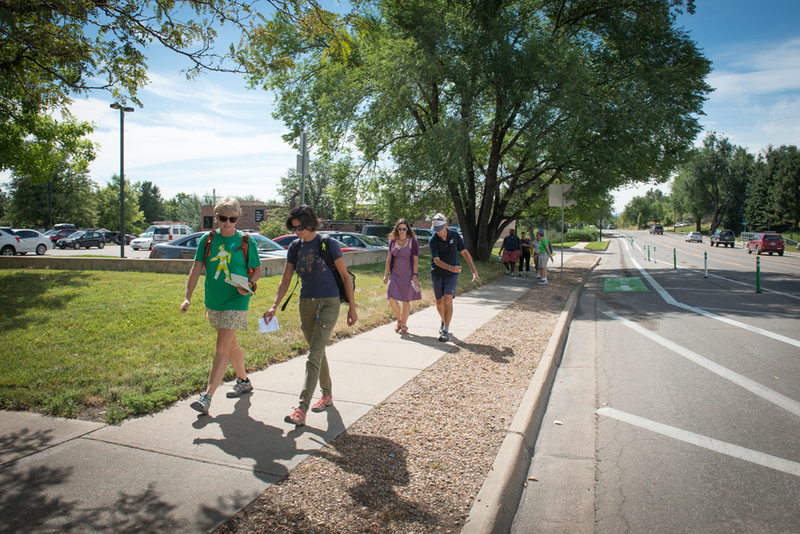 In September, Walk2Connect, Boulder Walks and GO Boulder collaborated to conduct two walk audits of the Folsom Street Living Lab, where the city has narrowed auto traffic lanes to enhance travel safety for bicyclists and pedestrians ("right-sizing"). While the changes produced much controversy that ultimately led to a partial rollback of the experimental lanes, particularly because of the impacts on drivers, the organizations involved wanted to understand how right-sizing traffic lanes has affected the pedestrian environment, as well. How does it actually feel to walk from Canyon Boulevard to Valmont Road along Folsom Street? During the first walk audit, on September 4, eight participants assessed six basic aspects of Folsom Street's walkability: sidewalks, street crossings, driver behavior, safety, comfort and appeal, and pedestrian behavior. The second walk audit, on September 22, asked participants to "Walk a Mile in Another's Shoes" by adopting different physical challenges, from walking with limited sight to carrying heavy bags of groceries and pushing a stroller. I documented what we discovered along the way as a participant, photographing the groups as we walked. A third walk audit, on October 10, will invite Boulderites to tell their own stories of Folsom Street in pictures, short narratives and journey maps. RSVP for that experience here. Read on to discover what the first two walk audits revealed about the importance of sidewalks and street crossings, how pedestrians' sense of safety and comfort vary along the corridor, and what practicing empathy for people with special needs teaches us about the streetscape. Planners and urban designers can specify different types of buffers to help protect pedestrians from vehicle traffic. Buffers are built or natural features, and their placement provides an important physical and psychological sense of safety. The walk audit participants felt most comfortable walking on the sidewalks along the east side of Folsom Street and along Canyon Boulevard where buffers are built into wide pavements or provided between the sidewalk and the bike lane. On most of Folsom Street, we enjoyed wide sidewalks where two people could walk side-by-side and have a conversation, as illustrated in the photos above. In some places, however, the sidewalk narrows around built or natural obstacles, such as the tree below. And in one block on the west side of the street, the sidewalk disappears altogether in front of a small shopping center, forcing pedestrians to walk through a parking lot. The changes made to the street design through right-sizing did not particularly affect our pedestrian experience where the sidewalks are already wide and well-buffered, but where they are narrow, the addition of the widened bike lane provided a clear benefit by allowing us to step out onto the street without worrying about getting to close to cars, as illustrated below. The bike lane in effect became the buffer. For those trying out a physical limitation in the second walk audit, the significance of wide, well-buffered sidewalks became even more clear. Below, Sarah is walking with a visual impairment (wearing glasses that simulate 85% loss of vision) and Morgan is helping her, but has limitations of her own with the stroller and the encroaching weeds. Sidewalks can be considered an essential democratizing element: where they are smooth, wide, even and protected, people of all abilities can use them comfortably. Several pedestrian crossings along Folsom have been improved with flashing signal lights and signage. 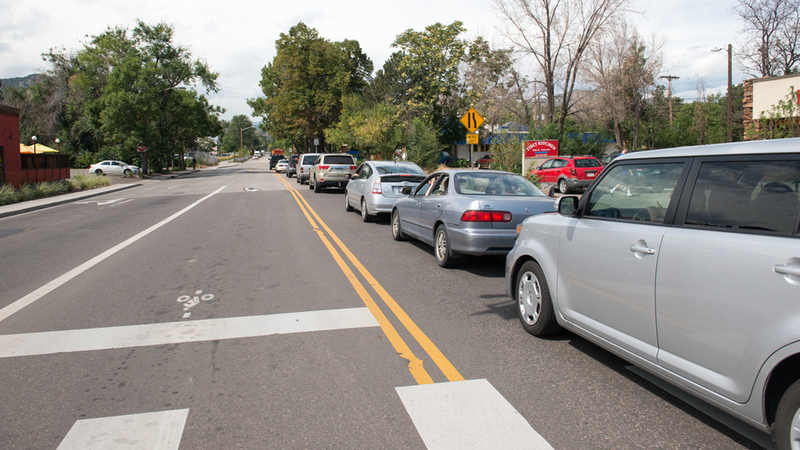 The "Heads Up Boulder" campaign has helped both pedestrians and drivers pay more attention in major crossings, but it can still be difficult to get across the street when bicyclists don't heed the signal, even if drivers stop. Here, we were just about to cross as several bicyclists whizzed past. In other parts of the corridor, the sheer size of the street and the location of crosswalks, turn lanes and signals make it challenging for pedestrians to negotiate. At the busy, wide intersection of Folsom and Valmont, for example, we had to walk past the curb cut to get to the walk signal button and come back again while waiting for the light to change. From a pedestrian point of view, the buffer created by the widened bike lanes and decreased auto traffic lanes (right-sizing) enhanced our experience. At the intersection of Spruce and Folsom, however, added crosswalks and changes to the traffic flow have created some confusion for bicyclists and drivers. Although pedestrians are well protected from the street, they have to take extra care to coordinate crossing movements with approaching drivers and bicyclists here. Problems also arise when traffic backs up behind buses stopping on cross streets, and cars stop in the crosswalk. How would it feel to walk along Folsom Street at night? We discovered a few forbidding areas, particularly on the west side of the street between Valmont Road and Mapleton Avenue, where ultra-wide intersections and high fences create blocks that can feel inhospitable to walkers. Lack of light on the sidewalks here and dense trees behind the fences gave us the sense that it would be dark and unwelcoming at night. 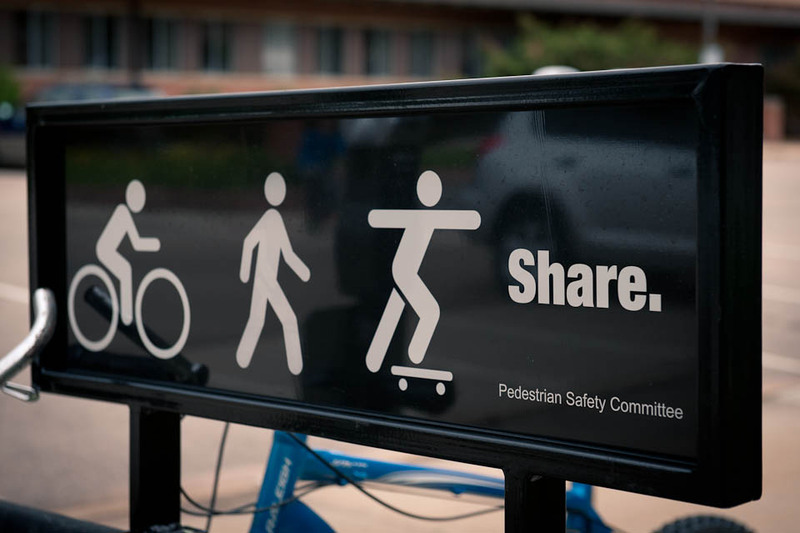 Safety and pedestrian comfort can both be created by similar elements: human-scaled built features (i.e., storefronts, not tall, blank walls), well-maintained natural features, and sittable spaces. Along Folsom, particularly on the east side between Arapahoe Avenue and Canyon Boulevard, pedestrian comfort comes in the form of attractive plantings, natural buffers, and plenty of shady street trees. One feature Folsom lacks is places to sit down and rest. We found only one public bench, and that was at a bus stop on the west side. Along this fast-moving corridor, pedestrians don't have many easy opportunities to take refuge from weather or traffic. Though it doesn't offer much in the way of places to sit down, Folsom Street does feature public art from The Big Picture project on the west side of the street, between Walnut and South, which makes the walk more interesting. For most people, getting across the street in the time allotted by a walk signal isn't difficult. But for elderly people and those with mobility impairments, crossing a wide, busy intersection can be terrifying. In our second walk audit, we had participants experience walking with difficulty by wearing an ankle band that forced them to hobble. Participants also tried walking while wearing glasses that simulated an 85% vision loss, carrying heavy grocery bags, wearing earplugs to simulate hearing loss, and pushing a large jogging stroller with a toddler in it (not all at once). Reflecting on their experiences, participants said any loss of sensory input drastically changes one's experience of the street, and limited mobility makes the corridor much more challenging and disorienting. The "Walk a Mile in Another's Shoes" walk audit was designed as an exercise in empathy, not an attempt to actually mimic what people living with disabilities experience. For those who live with sight and mobility impairments every day, additional or different challenges may come up along Folsom. Walking the Folsom Street corridor gave us a sense of how already in-place features such as wide sidewalks buffered from the street by built or natural elements and improved crosswalks make it manageable for pedestrians. But the varied quality and availability of those features along the corridor and the lack of places to sit and rest make it less appealing from a pedestrian point of view. 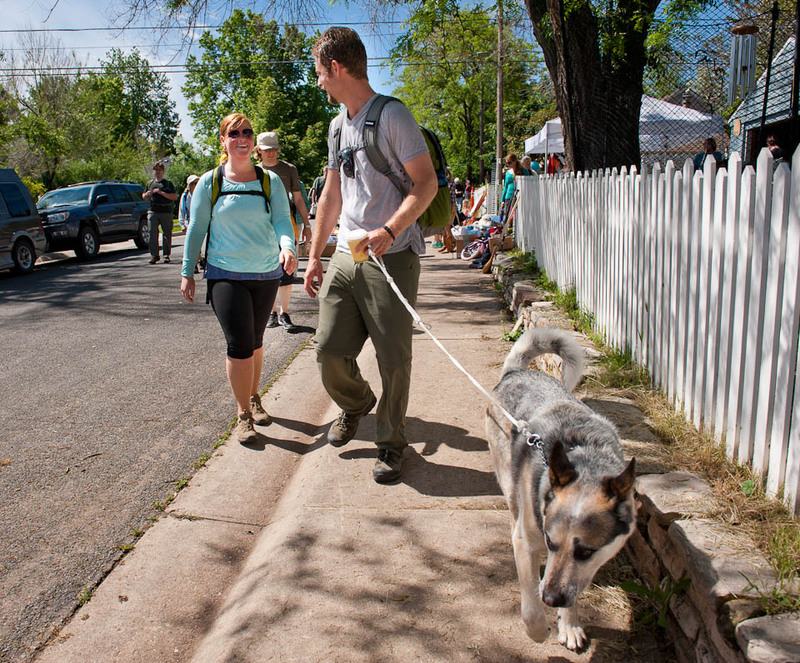 The third and final walk audit on October 10 offers the chance for Boulderites to tell their own stories of Folsom and capture what walking in central Boulder is like for them. Join me and other passionate pedestrians for this 2-hour "walk and talk" by signing up here and tell the city what works for walkers! — Gretel Ehrlich, from "Landscape," in "Legacy of Light"
I kicked off this summer on the move. In June, I started leading two walks per week as a Walking Movement Leader for Boulder Walks and Walk2Connect, joined other organized walks in my city, and walked more than 40 miles with my son for the Hike it Baby 30 Challenge. Having just returned from spending the first two weeks of July in Canada, indulging in the slow pace of summer vacation, I'm easing back into the rhythm of walking near and far, exploring the world on foot. The more I walk where I live, the more I value "Life@3MPH," and the more clearly I see everything around me. Walking invites me to engage with the environment and photograph evidence of community values. Artifacts of our collective aspirations, interests, fears, and traditions lie along every pathway and define every node. Case in point: on Thursday, while strolling to the rendezvous site for the fitness walk I lead in my neighborhood, I happened to pass a parked photo radar van just as a motorcyclist sped past it and triggered the flash camera. The fact that it wasn't ME getting that automatic ticket made me do a little happy dance ... because I've gotten snapped by that same blasted van in the past. The presence of photo radar machines exposes the city's interests in making streets safer by compelling motorists to slow down (there is an elementary school along this path), but it also evinces the many risks involved in driving. When I'm walking, I get to enjoy the fact that streets are multi-modal pathways, and I can participate in my community in ways I'd never get to if I were whizzing past in my auto-bubble. Further along on my Thursday stroll, I greeted a lady named Jean who lovingly maintains the planted buffer strip between the sidewalk and the busy intersection where she lives, and she does it out of sheer goodwill. She plants and prunes and beautifies the area for the benefit of all walkers, because she enjoys gardening. The work she does helps make taking this route on foot a joyous experience, and I was glad for the chance to thank her. "I wish that every body drove the cars less" - a tag hung from a wish tree in a north Boulder yard. On a recent ramble with Walk2Connect in a part of my city I don't know well, I got to experience another neighborhood's playful nature and delight in the kinds of details developed by residents who want to share their love of place. Along the way, we found a wish tree, on which one person pined for a less auto-oriented community, and a house with an artistic "wishing fence" that invited people to make their own secret wishes and stash them in jars and bottles. We found tiny local gardens nestled along a hidden path between streets on a sloping hill, complete with benches to give people a place to enjoy what the community had made. And we found more benches throughout the neighborhood, which indicated to me community values of kindness, love of nature and a slower pace of life. The benches - one installed by the neighborhood along a scenic street and one by the city along Boulder Creek - were well-placed under shade trees, facing views, inviting rest and contemplation. and sometimes, natural elements gave us a more subtle guide to the benefits of going slowly by. We got to contemplate the patterns in Boulder Creek's whitewater rapids and took some moments to pause atop a mountain overlooking the city. ... walking brings me closer to places and people and shows me how places inspire people to engage each other. It is my favorite mode of all for getting to know places near and far. Celebrate Life@3MPH with me by supporting Walk2Connect on this, the penultimate day of its crowdfunding campaign, The Value of Walking Together. You can show off your love of taking life at a walking pace by chipping in $100 for a Colorado-made leather wristband, or pay $50 for a Walk2Connect membership and reap the benefits of connecting with other walkers around the Denver metro area and beyond. The bracelet being offered for a $100 donation to The Value of Walking Together, made by Colorado's own Love Free Movement. Perhaps the band Poi Dog Pondering said it best when they sang about how "you get to know things better when they go by slow." Even 20 years after I first heard it, this song inspires me to get out and see by slowing down. Listen and enjoy! The Mayans, the Incas, and all the Polynesians. People would walk, where ever they had to go. — Poi Dog Pondering, "The Ancient Egyptians"
It is easy to fall into a habit of walking tight loops in Boulder, Colorado. Occupants of our fair city, frequently lauded as one of the best places to live in the United States, enjoy easy access to parks and green spaces, a pedestrian-friendly environment featuring 58 miles of paved multi-use paths and 145 miles of natural hiking trails, and plenty of pleasant public spaces in which to meet or retreat throughout the downtown and Boulder Creek corridors. There is so much to do and see and explore in each part of the city that I suspect many of my fellow Boulderites, are, like me, used to simply walking their own neighborhoods or driving from amenity to amenity, experiencing the city as a series of destinations, like pearls on a necklace. Yesterday, I had the opportunity to explore the full range of Boulder's urban and natural environments on foot, stitching together step by step different neighborhoods, nature trails, parks, shopping centers; places with smooth sidewalks and uneven ones; underpasses and the always-under-construction campus on the hill. I walked 9 miles in about 4 hours with 11 other "ramblers" - people from all over the world and a great variety of disciplines - in the largest loop I'd ever attempted around the city. As we connected with each other, thanks to the able facilitation of our Walk2Connect leader, Jonathon, we connected different parts of the city in our minds, writing new mental maps and learning new things about how Boulder works, and doesn't work, for its residents. Our group began by walking west along rain-swollen Boulder Creek and passing through a tunnel inscribed with an uplifting message. Jonathon then led us north up the Red Rocks trail toward Mt. Sanitas, on the western edge of the city. At the top, we stopped to learn about the historic significance of the magnificent red rock outcroppings to the Arapahoe and Ute peoples, who lived here long before 19th-century gold seekers set up camp and established a town at the mouth of Boulder Canyon. As one member of our group said, the rocks were considered not just the most prominent feature of a sacred landscape, but gods themselves. To the people who lived and worshiped here, the land embodied the spirits that sustained them. Now, our city stretches unceremoniously out before them at the base of this hill. Our group members connected easily, sharing ideas and stories and life experiences as we hiked down toward the Mapleton Hill neighborhood, one of the first settled areas of Boulder. The neighborhood had beautiful weather for its annual rummage sale. Neighbors sat out on their sidewalks and porches with items for sale as people crowded the streets, creating the atmosphere of a vast, winding marketplace. We walked right on through, noting the pleasant atmosphere of pedestrian dominance and slowed-down cars, without browsing much, talking with each other as we strolled toward North Boulder Park. ... but we soon made it to the park, where we stopped briefly to note North Boulder's excellent pedestrian access to both recreation amenities and essential shopping. The Ideal Market grocery store and shops on Broadway are just a few blocks from this park, as is Mt. Sanitas, with its trails. From North Boulder, we looped around to eastern Mapleton Hill, where Jonathon shared thoughts on the pedestrian friendliness of the historic district, facilitated by the classic pattern of inserting planted buffers between the streets and the sidewalks. I also love how old neighborhood streets often feature overhanging trees, creating little canopies to walk through. Jonathon is an advocate of "wildscaping" front yards, so he stopped in front of one home's habitat to describe the benefits to bees and other wildlife of planting a natural landscape rather than grass. From lush Mapleton Hill, we turned toward Boulder's hardscaped eastern edge, splitting up and walking down Pine Street (a dog-friendly zone) and the Pearl Street Pedestrian Mall (on which dogs are not allowed). We then met up on East Pearl Street and took a lunch break at Snarf's Sandwich Shop. Storm clouds rolled in over the Flatirons. As we traversed the 29th Street Mall, a sprinkling began that lasted the rest of our journey. We briefly took refuge in a frozen yogurt shop before turning onto the Boulder Creek Path and crossing the University of Colorado campus. With just a mile or two to go, we glowed with gratitude and the joy of exercise on a cool summer's day. Little by little, step by step, we made our way back to our starting point and on with our afternoons, renewed, refreshed, happy, knowing more about where we live and having made some new friends. To learn about other walking opportunities like this one, as well as shorter trips and special walking programs, check out the events calendar on the Walk2Connect website. While you're there, please click on "The Campaign" and make a contribution to Walk2Connect's crowdfunding campaign to raise money for Walking Movement Leaders to continue providing health-giving, friendship-building, life-enhancing experiences like the one pictured in this post. Thanks, and hope to see you out walking soon! Kicking Off Boulder's Walk and Bike Month with New Adventures and a Party! I've always been an avid walker, for fitness, local errand-running and for the sake of discovering tiny curiosities in cities, as a kind of modern-day, female "flâneur." In May, I stepped up to a new phase of life on foot: I've signed on as an Ambassador for Walk2Connect, a Denver-based organization dedicated to inspiring people to walk more and making places more pedestrian friendly. The organization was founded by Jonathon Stalls, a champion of "life at 3 miles per hour," who walked from the Delaware coast to San Francisco in 2010 and has since started a movement to help people slow down, reconnect with themselves and others, and reap the spiritual and physical rewards of walking, whether just through their neighborhoods or between different cities. I'll be hosting two weekly "same time same place" walks starting next week as Walk2Connect and Go Boulder kick off Boulder's Walk and Bike Month. Join our Boulder Walks Meetup group to sign up for my Tuesday morning meditation and Thursday morning fitness walks in South Boulder! I've nicknamed my fitness walk route the "gratitude loop" for the awesome views and great perspective it provides on the wonders of where I live. Next Thursday night, June 4th, Walk2Connect is hosting a dance party at GreenSpaces Denver to launch its new crowdfunding campaign, the proceeds of which will help support walk ambassadors like me! It's going to be great fun - come out and party for a fabulous cause, enjoy great music and let loose with me and my fellow ambassadors. You'll meet Jonathon and the amazing Rachel Hultin, Walk2Connect's community program director and a fellow urban enthusiast, watch the organization's awesome new video and learn all about our work. Hope to see you there, or out on a walk soon! Join my Thursday morning fitness walk in Boulder to take in this awesome view! We explored artistic alleyways on our ambassador training walk in Denver. Darcy Kitching and Nederland, Colorado, Mayor Joe Gierlach look through the original Community Storybook, produced for the town in 2011. Photo by Joe Gierlach. The Community Storybooks team, Darcy Kitching and Vickie Berkley, will be in Nederland, Colorado, tonight to present ideas for updating the Nederland Community Storybook to the town's Board of Trustees. Nederland Mayor Joe Gierlach featured an article about Community Storybooks on his NederMayor blog today. Check it out! — Richard Louv, from "Last Child in the Woods"
Growing up in suburban Denver with a man-made reservoir just beyond the backyard fence and enough adjacent open space to build cattail and willow dens, climb trees and get lost in daydreams, I had some sense that I was lucky. I knew our little patch of nature between developments was special, even if it did stink sometimes when dead fish washed up on the lake's sandy shore in slimy nets of green algae. My brother and I made the most of that semi-tamed space, playing outside in the trees and reeds until mom called out the back door to bring us home again. The land around our suburban greenbelt house became a kind of binding for the sensory scrapbook of my childhood experience. And the pages filled up year after year with memories of the places my outdoors-loving mother helped us discover. Mom came to Colorado as a young English teacher in love with the mountains. She couldn't stand being cooped up inside for any longer than it took to grade a stack of papers or read a good book. When my brother and I were little, she carried us up mountain trails on her back. My early memories glimmer with the soft greens and golds of pine forests and smell of campfire smoke. We spent weekends catching tadpoles and hiding in old tree stumps around our property near the town of Fairplay, or chasing each other up switchback trails past purple columbines and ropes of wild strawberries. We skied in the winter and spent many summers in rural Oklahoma, where mom's parents lived, swimming, fishing, catching fireflies, and tramping through deciduous woods filled with fragrant hickory and flowering trees. We took epic road trips through every national park. We hiked the Grand Canyon and stood sore and stunned by the views before us. My mother cultivated in me an adventurous Colorado spirit and modeled awe: the breathless appreciation of all things wild and beautiful. My mom, Sara Varney, in rural Oklahoma with the tipi her father built, circa 1980. This was one of her favorite places in the world. When I heard Scott Sampson, the author of How to Raise a Wild Child, interviewed on Colorado Public Radio recently, I reflected on the gifts my mother gave me by simply expecting me to go outside. She had a horror of "vidiot" kids glued to the TV; she detested the sight of us "wallowing" around on a nice day. We didn't have video games at home. I spent much more than the 7 minutes a day outdoors Sampson says kids are getting on average now. Mom on our Grand Canyon rim-to-rim hiking trip, 1987. As suburbanites, my brother and I weren't as "wild" as I hope my own son grows up to be. My family and I live near mountain open space parks, and I can imagine my son walking the trails on his own as he grows up, climbing the rocky outcroppings, sitting and thinking near meadows filled with wildflowers. He might even see a black bear while hiking around home, and will surely stop to admire bucks and does nosing around in the underbrush. He may have more raw material for his imagination close at hand than I did in my childhood reservoir-and-reed environment, but any kind of wilderness is great for a growing mind. On our local hikes over his first two and a half years of life, we have listened to the crunch of our footsteps in the forest, gawked at graceful raptors in the sky, tossed rocks into rivulets, and met hundreds of friendly dogs walking with their owners. My son at 18 months collecting rocks on a trail near home. Of course, families don't need to take big trips or live near mountains to cultivate a love of nature in their children. As Wild Child author Sampson said in the CPR interview, "One of the most powerful ways to [encourage outdoor time is to create] family nature clubs. It can be as few as two families and trust me, if you start this, you may have 50 families come join you (because that's happened before). It's just a way to get families out into nature on a regular basis together. The parents love it because they get to just hang out together and talk grownup stuff. The kids love it because they're playing with all these other kids." Along with building family nature clubs through the Children and Nature Network, parents can join organized walks with Hike It Baby in more than 90 cities in the United States. Here in Colorado, we have a very active Hike It Baby network, with walks and hikes happening throughout the state daily. Little O and I joined friends on a HIB hike in Eldorado Canyon last week and loved it. Check out listings of local hikes here: hikeitbaby.com/find-a-hike/. I'm trying to raise a "wild child" by accompanying my son outside every day, not just on hikes, but also to do things pictured in the collage below: to play around the lake in our local park, "pet" slugs in the rain, wander through the hay-bale maze at Sunflower Farm, throw rocks into Boulder Creek, and just lounge around enjoying the view wherever we happen to be. Some of the many activities we do outdoors. My mother was a remarkable person whose passion for the outdoors and connection to beautiful places from deserts to rainforests and everywhere in between forged in me a deep commitment to sharing that love and learning how it shapes who we are in the world. It all started when she took me along on her own adventures, it grew as she encouraged me to discover places for myself, and now it continues as I cultivate the same kind of fondness for all things outdoors with my own child. My mom, Sara Varney, passed away five years ago this September. I miss her this Mother's Day as ever, but it's important to me to celebrate her legacy and pass it down to others. In June 2010, mom wrote a letter to her friends at Denver Health, where she had volunteered in the emergency department for 20 years, expressing her genuine hope that they would all do her the great favor of getting out into nature when she couldn't any longer. She wrote,"enjoy the gorgeous days of summer, lie on a blanket under a tree, look up at the leaves, sun, sky, clouds, and thank God every day for life." Hiking with my son in Rocky Mountain National Park, 2013. Let's all get outside and do that however we can. I am so grateful to my mother for showing me what a wonderful world we have all around us. Where are your favorite places to get outside and enjoy the fresh air? What do you need to support your children's love of nature and the outdoors? Leave a comment and join me in a conversation about raising happily "wild" children. Happy hiking! This morning, I drove up Boulder Canyon to Nederland, the first town for which my colleague Vickie Berkley and I created a Community Storybook, to meet with Mayor Joe Gierlach about updating our project and to learn more about the town's innovative approach to community engagement and sustainability planning. Vickie and I had collaborated with the previous mayor to communicate the results of the town's progressive Envision Nederland 2020 process back in 2011; since then, Mayor Gierlach and his team have effectively operationalized the community's vision and all of the successive master plans, breaking them down into 160 action items anyone can work on. It's a public administration masterstroke - an ingenious way to make the most of limited town resources while growing the body of potential participants in achieving the community's goals. Mayor Gierlach writes the NederMayor blog (watch that space for an upcoming article on Community Storybooks!) and is a regional leader in democratizing public policy-making. Over the past four years, he has overseen Nederland's response to a host of natural disasters and has spearheaded the implementation of a community-based and crowd-sourced approach to problem solving, as well as a whole new way of approving public projects in town that encourages broad community participation and creative thinking. His goal is to make Nederland the most sustainable small town in the country. We are excited to engage with Mayor Gierlach and the Nederland Board of Trustees on telling the town's stories. We'll post more updates on the project as it develops. Reif Larsen published an essay in Friday's New York Times that struck a deep chord with me, comparing as it did the struggle of family travel in the United States with getting around in Europe, specifically Scotland, where places accommodate the needs of parents with young children better. In his essay, Larsen laments the absence of nursing rooms and the dearth of highchairs in the Newark airport and reports a distinct feeling of being unwelcome wherever he and his wife took their young child when they lived in the United States. While I haven't sensed the same animosity aimed at my offspring ("It was as if people secretly wished we could stow our child in cargo so that we would not disrupt their game of Candy Crush," Larsen writes), I agree that we need better facilities everywhere for caregivers of young children in this country. That very idea has been on my mind ever since I first left the house with my 6-week-old son. We've now traveled to five countries as a family, and everywhere we go, I pay special attention to the ways parents and children are either implicitly included in or excluded from public space. Take Vancouver, British Columbia, for example. We travel to Canada about twice a year to visit my husband's parents, and each time we go, I find more great examples of how the city accommodates families. Let's start at the airport. The Vancouver airport features family "washrooms" between each and every bank of male and female toilets. No need to hunt around on unknown concourses - they're everywhere you'd find a regular restroom and are available to either parent. The family washrooms include one of the most important, and, in my experience, least considered, features known to diapering parents: a changing space integrated with a sink AND a trash can. This beautiful built-in makes it virtually effortless to clean up a baby's bottom and keep yourself clean, too. The family washrooms also offer plenty of hooks and benches, allowing parents to put the diaper bag down and sit comfortably without having to pile everything on the floor (although these floors are considerably less grimy than in most restrooms, I'm still grateful that I don't have to sit or change my baby on them). These washrooms are also big enough to wheel a stroller into. Right outside of this particular washroom is a wonderful children's play area with slides, climbing structures, a maze, and soft flooring. Families can relax, children can play, and either parent can take the tiny one for a change and a feed whenever needed. We love this place. Another place we spend time in Vancouver is Granville Island Public Market. Last year, I discovered the wonderful nursing/changing room there. This room meets the needs of parents and also functions as an emergency care room. It's a great private space for anyone who needs to step out of the action of the market for a while to care for themselves or others. Though it doesn't have a toilet, this space does have a sink with a wide countertop and a pull-down changing table. Vancouver's TELUS World of Science museum also accommodates families - particularly nursing mothers - beautifully. I found a comfortable nursing room there when we visited last year. This room features two-way glass, letting moms sit contentedly and feed their infants while other family members play in one of the museum's fabulous children's discovery areas. Here, mothers can find cozy chairs and a changing table, though no sink or toilet. In Britain, there are way more resources devoted to children than in the United States. This is a generalization, of course, but in my experience it’s very apparent that for the Scots, family always comes first. This is reflected not just in a general attitude of the Scots toward work as a necessary but nonessential part of life (“Work stays at work,” they will tell you), but also on a legislative level, as can be seen in the incredibly generous (and mandatory) maternity and paternity leave laws (52 weeks in Britain). As I've shared ideas about my mission to improve places for families here at home, I have received some wonderful stories and pictures from friends with young children as they have discovered great spaces for caregiving - spaces I call "Baby Havens." My friend Liz and her family just returned from Scotland, where they found a room Larsen and his own family have surely delighted in, too. This lovely space in Edinburgh Castle is situated between the men's and women's restrooms, so it is accessible to both parents. Liz loved the natural light in this space, the hooks for her bags and jacket, the comfortable nursing chair, and the integrated sink/changing table (my favorite feature!). The room is lit by skylights, pictured on the left, and it also offers a conveniently located vending machine stocked with diapers. While traveling through the Geneva airport recently, my friend Muratha and his family discovered an equally inspiring baby-care space. There's that fantastic changing table/sink combination, and a great play space to occupy little ones while families wait for their flights. This space also features a feeding area with high chairs and a rest area with cribs. For weary young-family travelers, spaces like this can reduce stress and make big transitions bearable. 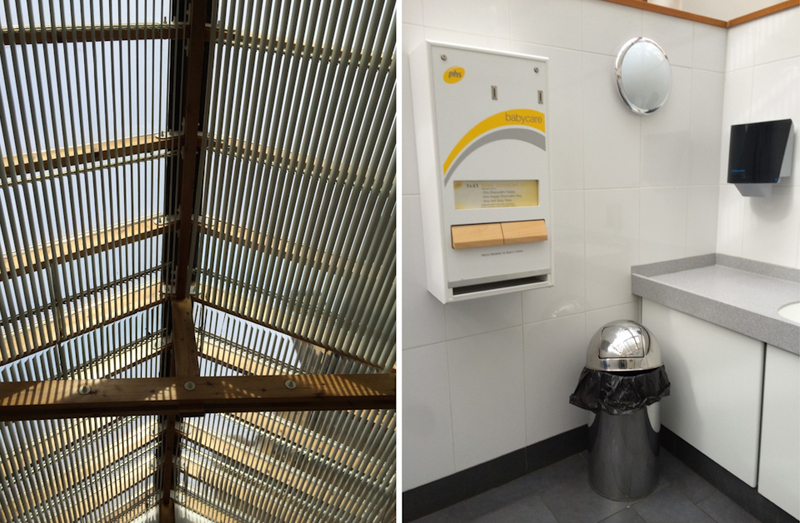 Family restrooms and baby-care spaces in the United States, when available, tend to offer fewer amenities than shown in these examples from other countries. They may have pull-down diaper-changing tables, but these are typically located away from the sink and trash cans; they may have child-sized toilets, but rarely offer a comfortable chair for nursing or feeding. I have found a few places that truly meet the needs of parents with young children in the Denver/Boulder area, but the families I have talked with agree that we need more, and better, caregiving spaces. Where have you found families belong? I'm collecting more examples of places that work and recruiting help with documenting them. Please get in touch with me to share your stories: darcy @ placesmakepeople.com. Happy travels! Follow Places Make People on Facebook! I'm now posting shared articles and photos on Facebook as a quick way to post thoughts on how places influence people's thoughts and actions. Like my page to join the conversation: Places Make People LLC. This evening, NPR featured a story about the "delicate dance" schools in the United States have to do to incorporate digital technology appropriately into their programs. With many students' constant access to smartphones, tablets, e-readers and computers, there is growing concern that too much individual screen time is negatively impacting young peoples' ability to read social cues and understand others' emotions. The question for schools becomes how to balance screen time with social time, online activity with active outdoor play. In Meru, Kenya, where Technology Partnership works with 35 schools, there is no danger of computers, tablets or e-readers replacing interpersonal collaboration or social interaction. Instead, computers in Meru schools provide a means to group learning, along with a necessary window onto the world and essential skills for 21st century success. Like their American peers, students working on computers in Meru learn how to write reports with word-processing programs, create spreadsheets and presentations, conduct internet research, create and post videos and more ... but they do all of this in pairs or groups, and when school is out, so are the screens. The students at our schools in Meru each share a computer with about 70 other people. But while the scarcity of computers necessitates collaboration, the students also have a way of working together that makes the collaboration worthwhile for all. They help each other. They share ideas, insights and excitement. When I visited Meru in 2009, I saw groups of students huddled around Technology Partnership-provided computers laughing, encouraging each other, telling the person in charge of the keyboard what to do, and taking turns typing while others provided aid or instruction (see photo above). These kids don't go home and watch hours of TV or play video games in dark dens of solitude. They don't text all day long or stay glued to their iPads during meals. Instead, they go outside and play soccer. They cook meals for their siblings or do homework by lamplight. The goal of Technology Partnership is not to make computers and other digital devices so ubiquitous in Kenyan schools that educators have to fret over how much screen time is too much. It's simply to bridge the massive digital divide between American and Kenyan students and teachers so that our Kenyan partners have enough technology to achieve their own goals for improving critical thinking skills, educating young people about the world and their opportunities in it, accessing digital learning resources, generating entrepreneurship and e-commerce, and creating 21st century leaders. While we were visiting schools, we stopped by one of our early partners, Meru Boys Secondary School. They have been a partner since 2005 and have really expanded their computer program since joining our partnership. They found additional support to enable them to have two computer labs with 30 computers in each lab. During our visit this past summer, we stopped into a science class where a young man, George Wabuki, was teaching the students using a computer and projector to review images of parts of the digestive system. As he was talking about different parts of the digestive system, he would point to the part on the screen and ask the students what each part did for digestion, then they would discuss that element and move on to the next. When we were about to leave, the teacher, Mark, told us the young man leading the instruction was a student in his class and that they usually took turns teaching the class through PowerPoint images and graphics on the computer and the projector. It was so amazing because only 10 years ago, instruction was done verbally with no resources, no images, and students took notes as they listened to the teacher. The teaching and learning we witnessed in this classroom demonstrates just how far the schools of Meru have come in embracing the strengths of technology to make learning more engaging, real and informative. L to R: Dominic Ndwiga (one of our leadership team and head of IT at Meru Boys); Barbara Bates; Mark Namaswa (science teacher); Anton, student; George Wabuki, student who was teaching the digestive system to the class. To hear more wonderful stories like this and learn how you can help Technology Partnership expand its reach and empower more students and teachers to keep learning and leading together, join us this Saturday, October 4, for the Fabulous 42 Formal, or make a donation on our website today. Thank you! Today's post is less about place than the place of objects in cultural memory. It seems, my friends, that the object depicted on my T-shirt has been lost to the winds of time. What is it? When I first donned this shirt at home, little O pointed at it and said, "Helicopter!" It took me a moment to understand what he could possibly mean, but then, when I looked in the mirror, I realized that the not-so-ancient typewriter pictured on my chest resembled a kind of massive, military-type aircraft of some sort. If I squinted. But again today, when we walked into a friend's house, her son (like O, a year and a half old) pointed at my shirt and said, "Airplane!" Now, to me, it's truly noteworthy that our tiny boys, with their limited exposure to aircraft, were able to take such an abstract leap from those experiences and fit this picture of a Royal portable typewriter into the aircraft category in their minds. They have never seen a real typewriter. They have never heard that distinctive clacking of keys and slapping of type bars on paper that filled my childhood and early adolescence. And it's likely they never will. To the boys, this machine might as well be a helicopter. I'm sure a fair number of them were thrown out of windows in their time. Though computers entered my life fairly early - my dad is a true technophile who owned one of the first Tandy or IBM type machines, and there were computers for learning basic skills on in my elementary school - I learned to type on an electric typewriter in junior high, and my mother used one until around the year 2000, when she could no longer buy new ribbons for it. I remember riding along with her on trips to the typewriter repair store in Lakewood, Colorado, as a kid. It was just off Colfax near the Westminster Mall. It was a store packed with machines and parts of machines and small boxes of typewriter ribbons of many colors. It might even have been the same store where mom took the vacuum cleaner to be repaired. Her motto, which I have displayed in a cross-stitch sampler above my desk, was, "Use it up, wear it out, make it do or do without." And she did. The artist who made my T-shirt chose his design with irony in mind. The word "LAPTOP" is written on the piece of paper sticking out of the top of the typewriter. As someone who loved typewriters for their retro utility but was herself an early computer adopter (my first laptop computer was one I had to insert a floppy disk into to boot it up, since it had no hard drive), I found it funny. I'm not shy about revealing how many years I've been around (clearly, since I'm hosting the Fabulous 42 Formal), so I also wear this shirt as a badge of middle-aged pride. That's not a helicopter, little one - it's a machine mommy used to write on years ago! I didn't post a photo yesterday. That's not because I didn't make any photos ... but the few I did snap disappointed me. I've been thinking of little else besides the upcoming Fabulous 42 Formal and the Cortez Community Storybook, so getting out for the purpose of capturing significant places has gone a bit by the wayside. But today, two magnificent outings made up for my missed day. This morning, my great friend E and I took our boys down to the Denver Zoo - an institution that has changed dramatically (for the better) since my childhood and that has remained a place near and dear to my heart. We got there early enough to see the lions lying out in the sun and to be among the first to hear the Howler monkeys singing in their enclosure. Later in the day, O and I walked up the Pearl Street Mall and saw the tiny little love note in the photo at the top of this post. Good reminder. Let's love: the animals we admire, the people we travel with, the places and passing wonders of every day. Kenya on my mind: this proud lioness captured at the Denver Zoo this morning reminded me of photo safaris I've done in Kenya and also of the great opportunities volunteers who travel to Kenya with Technology Partnership can have. We work in schools, but we get out to see the wildlife, too! Teachers everywhere invest their own money and much of their free time in efforts to ensure their students succeed. Whether buying supplies and snacks for students who can't afford them or devoting their evenings, weekends and hard-earned vacation time to designing lesson plans, writing curriculum and grading assignments, many teachers sacrifice a great deal to help their students realize their own potential. In Meru, Kenya, where Technology Partnership works, a group of teachers is doing all this and supporting their community of fellow educators by training other teachers on how to use computers in the classroom. Our local Leadership Team, made up of teachers who have taken the computer trainings led by our U.S. Director, Barbara Bates, is empowered, skilled and highly dedicated to the cause of bringing teaching and learning standards in Meru and in Kenya into the 21st century. They volunteer their time to conduct trainings, based on the Intel TEACH curriculum Barb has been using for the past several years, and provide guidance, mentorship and support to teachers in the community as they learn how to integrate new technology into their classroom routines. Exposing both teachers and students to the use of technology in learning and teaching. Improving national examinations results. "In fact, TP schools that actively use technology in learning and teaching are the ones leading in top scores in national examinations for both high schools and primary schools," John says. Communicating and sharing skills and ideas. "For example," says John, "on the occasion of the prize-giving day for Meru county schools on 20th of July this year, the education department of the school district needed videos and photos of the occasion. Children from one of the TP schools situated in a slum area (CCM Township Primary School) did that work using tablets. It was fantastic." Increasing the efficiency of teachers. Creating opportunities to access educational opportunities and information, and do research on the internet. "So far," says John, "of all the other non-profit organizations that have been involved in getting schools to use computers, it is only TP that has recorded great success because of the difference in its project implementation approaches. As Barb put it in her last report, indeed we are now in an acceleration phase because of the appetite for technology created by TP through effective project implementation methods." Help us continue to stand up for teachers and students in Meru, Kenya, and provide them with opportunities to expand their resources. Make a donation to Technology Partnership via the button on our website today, or join us at the upcoming Fabulous 42 Formal at the Posner Center for International Development in Denver to learn more about our work and enjoy a fantastic evening! You might even consider traveling to Meru with us in the future to see the success (and the safari parks!) first-hand. Listen to the stories of these teachers who visited our schools in 2013 and be inspired! This morning, I took a strenuous hike up Boulder's Mount Sanitas with O on my back and my husband at my side. We walked past many hikers with dogs O invariably found "cute" and scrambled up rocky outcroppings at the top of the mountain. All the way up, fellow hikers commented on the added workout I was getting by carrying a 25-pound boy on my back. It felt great. I needed it. The company, the exercise and the views lifted my spirit and reminded me of how grateful I am to live here, to live now. Today is the fourth anniversary of my mother's death. My heart was heavy as we hiked, but I stepped lightly, knowing that being somewhere beautiful, finding peace in the sanctuary of nature, is exactly what my mother would have wanted. She was a hiker herself, as well as a world traveler, a world-class teacher, a grandmother, a sister, an independent woman. As a retiree, she volunteered most of her time giving tours of the Colorado state capitol building, working in the ER of Denver Health (the city's notorious "knife and gun club" and level-1 trauma center), judging at speech and debate tournaments, working at the Jefferson County Action Center to help families in need, driving for Meals on Wheels and taking on any number of additional projects as she was asked. In that spirit of productivity and support, I spent the rest of the day getting things done. First, I went to the Posner Center to figure out how long a red carpet we'll need for the Fabulous 42 Formal (answer: 50 feet). The Posner Center lifts my spirit every time I walk into it. The place is home to more than 60 organizations doing great work around the world, and you can just sense the creativity and collaborative productivity going on there, even on a Sunday. Not surprisingly, I wasn't the only one in the building. It's also an uplifting space because it's just plain gorgeous. The designers created beautiful details and maximized joy in the space by building in plenty of natural light, using quality finishes and creating innovative spaces for meeting, collaboration and everyday work. It's a model building for what is becoming an important approach to work in many industries. After checking on the details at Posner, I headed over to Diebolt Brewing Company, a founder of which is my mother's first cousin. They were busy serving up delicious beers and snacks for their first anniversary celebrations, so I hung out at the bar and sipped on an amazing bourbon-infused porter while chatting with brewer Jack Diebolt (who I guess would be my mom's first cousin once removed). The Diebolts have created a charming little brewery at 39th and Mariposa that truly lifts the spirit, not only through liquid spirits, but also through great hospitality. They're a fun bunch to chat with, and Martha Diebolt (my mom's cousin) is always a delight, with her optimism, charm and genuine kindness. I love these guys. And I'm excited about sharing the love by offering two of their delicious brews at the Fab 42 Formal. I dropped off some flyers about the event and had fun talking with the Diebolts about how all of the details are coming together beautifully. I made my way home after hanging with the Diebolts and spent the evening reading to O and enjoying a delicious dinner with my family. Our home lifts my spirit every time I walk into it. This place lets me relax and be myself. It expresses my family's histories and our individual discoveries. It brings us together and gives us room to be apart. As I contemplated the spirit of my too-early-departed mother, I felt graced by many spirit-lifting experiences today. A good day to be alive. Last Tuesday, I set off with little O and my colleague Vickie on a road trip down to Cortez, Colorado, to finish up the photography and writing for our latest Community Storybook project. O did remarkably well for having been strapped into a car seat for a whole day, and then having his routine upended because of my work schedule, but he got every last bit of my energy left over from running around town, so I couldn't post while we were away. I came back with more than 500 photographs to round out our previous series, and I think we have everything we need at this point. I am learning so much from these projects, and working with the Cortez Heart and Soul Community Advisory Team is inspiring. They know their town inside and out. As we strive to make the values they have identified visible, we sometimes stumble into our own assumptions or observations that miss the mark. For example, I wasted a precious evening with a gorgeous sunset and a textured sky photographing a subject I thought was cool, when I should have been out at a different location capturing what the residents value more. That was the quality I was after: deep blue, fully-lit neon, lots of movement in the street, twinkling street lamps. I really liked this frame and was excited to show it to the committee the next evening as a potential cover shot. When they saw it, one member of the committee immediately said, "That's not us." The shot was too flashy, too dark, too heavily styled. They wanted a more honest depiction of Main Street, showing the valued slow pace of life in Cortez and the friendly exchanges that make it a great place to live. We may still use the first shot on the inside cover of the book, because it does illustrate that Main Street is active and vibrant, but the second shot is out. I realized that I could have spent that evening, our last free evening in town, making use of the perfect light and the help I had with O to photograph hikers at the Carpenter's Natural Area - something the committee wanted that I wasn't able to capture. I'm learning loads about how to manage my time, the light and traveling with a toddler! That was Wednesday. On Thursday, I focused on the pastoral parts of town and photographed some landscape scenes, as well as some details that help tell the story of Cortez. The history of Cortez is defined by ditch digging, canal building and flume funding: the drive to get water from the Dolores River to this dry but promising spot located on neither river nor railroad. Cortez was a speculative venture. Its founders believed its sandy red soil would yield good crops, but the lack of water required intensive engineering and ingenuity to make the dream a reality. Those early speculators were right, though: the area has become one of Colorado's important agricultural centers. Cortez is also renowned as a world-class mountain biking area. One of the best sites for mountain biking, Phil's World, boasts nearly 30 miles of trails and attracts bicyclists from all over the country. Dennis Wright of Memphis, Tennessee, kindly modeled for me when I raced over to Phil's World for a quick shot for the book. Thursday evening, we had our meeting with the Community Advisory Team, which went really well, even considering my folly with the Main Street twilight shots. They seem pretty pleased overall with what we have produced. The book will be finished next month. On Friday, I spent the morning finishing up assignments, and then we headed home on an 8-hour odyssey in our rented minivan. We stopped at the scenic overlook on Wolf Creek Pass because it was just so perfectly beautiful that afternoon. I've always loved this part of Colorado, with its dramatic landscapes and long vistas. We stopped again at the top of Wolf Creek Pass to let O stretch his legs. I snapped this shot of the little rock lover in front of a broad stand of pine-beetle-killed trees, which dominated the top of the pass. We made it home close to midnight, after returning the rental car and driving back up to Boulder. Exhausting, but a great trip for a project I'm proud to be a part of! Technology Partnership has provided more than 500 computers to primary and secondary schools in Meru, Kenya, and taught teachers how to teach with them. Increasingly, however, our partners in Meru are seeking mobile technologies to help them work more effectively and get their students caught up with the developed world. We have donated some laptop computers and tablets to our partner schools, but we're also investigating ways to help students and teachers get access to smartphones and small tablets to ensure they can complete assignments, work collaboratively and expand their learning horizons. Computers in school-based labs are great resources, but mobile technology allows for flexibility, connectivity and collaboration in a way traditional desktop computing doesn't. Our mobility and mobile connectivity are assets we take utterly for granted in these days of pocket computers and ubiquitous wi-fi. It's even something we have to carefully manage for our children, lest they get too hooked on the iPad or iPhone. We know how important these tools can be for learning, entrepreneurship and the development of important skills. For students and teachers in Meru, Kenya, mobile technology still means a cell phone you can text on but little else. Help Technology Partnership give our Kenyan partners access to tools for 21st century success. Make a donation today, or attend the Fabulous 42 Formal on Saturday, October 4th, to celebrate and learn more about our great work! * This is the fourth of 6 #TPTuesday posts focusing on Technology Partnership, a 501 (c)(3) nonprofit organization, on whose board I serve. Today, O and I went on a hike with my gal pals Ellen and Tara and their daughters, as well as the 7-year-old twins of Ellen's friends Sue and Scott. Scott is dealing with a recurrence of brain cancer and is being treated at the Cleveland Clinic. Ellen took care of the twins for the past week while both of the twins' parents were away. They seem to be managing the stress of their dad's illness quite well, but they need lots of time and space to play, run, climb and forget about the heaviness in their lives. 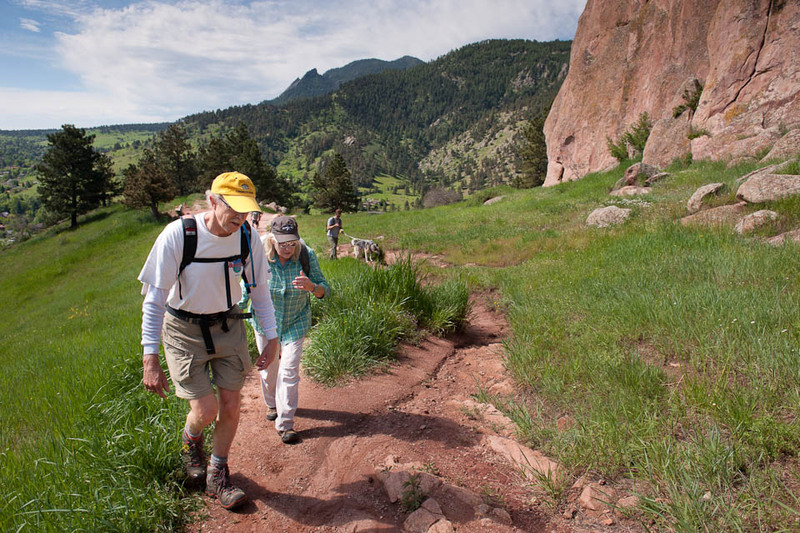 The rocks, trees and trails in Boulder's open space were just what the doctor ordered. We got out and got silly - click on the image above to see the next shot in the series. Growing up in suburban Denver, I had access to plenty of overgrown, undeveloped patches of land with climbing trees and dense shrubbery. I would spend hours outside after school, making play houses and dens around the reservoir behind our house and hiding out, watching passersby on the walking paths and imagining my dream apartment in the sky. I never had a built fort or tree house, but loved climbing and crawling into natural secret spaces - the hollows of evergreens, the canopy of leafy trees. A few weeks ago, during our neighborhood block party, O and I wandered off to explore, and he led me straight to an opening in an evergreen shrub. He'd found a den! I'd never noticed the hollow space before, but there it was, inviting us inside. O crawled right into it and looked up through the hole in the top, which lights the gloomy interior. It's a cozy little den, but big enough for me to sit inside, too. After lingering for a moment, O crawled through the smaller hole on the other side of the space, which I had to squeeze through just to catch him before he toddled off without me. Today, I returned to the den while O had dinner with his daddy. It's a charming little space - exactly the hideout I'd have chosen if I'd grown up in this neighborhood. I'm delighted that O discovered it himself ... and happy that I'll know where to find him when he wanders off on summer evenings to play! — Kylin, Maria. “Children’s Dens.” Children, Youth and Environments 13(1), Spring 2003. Retrieved 9/13/14 from http://colorado.edu/journals/cye. I feel so fortunate that my little O has already discovered a great den in our neighborhood, which is in no danger of being cut down. As he gets older, he'll be able to explore more widely, finding dens in the forests that surround us. We live in an area where planned tracts abut natural preserves, but for children in denser neighborhoods with more manicuring, finding these special, secret hideaways can be more of a challenge. As long as a little wild is allowed to creep into the city - and as long as those unmanicured spaces are safely, freely accessible - children will always find ways to claim their creative space. Certain places can truly make friendships. They invite gatherings, provide warmth and sustenance and delight the senses. They promote joyful discovery and don't impose excessive rules. They are places where everyone feels comfortable. My friend Tara's house is such a place, and it's where a group of us meet for "girls' night" gatherings every month or so. Today, on the morning of the first snow of the season, the members of our group who have children enjoyed a "girls' brunch," for which Tara provided homemade scones and jam, farm-fresh fruit, hot tea and deliciously sour concord grapes from her yard. Tara's home has always been the hearth for our group of friends, but it hasn't always been the place pictured above. She recently bought and remodeled this small cottage in central Boulder for herself and her 4-year-old daughter, after moving from an equally charming and cozy apartment in a house nearby. It's Tara's sense of style, her artistic eye and her quirky collection of treasures that make her home special, wherever it is. It doesn't hurt that she also has fantastic cooking and baking skills. The place is always filled with the delicious smells of something healthy and hearty bubbling on the stove. This is a place where friendship grows. Before we had children, we would gather for late evenings of wine and tea and chocolate in Tara's apartment, nurturing our connections and giving each other the support we needed. In the past four years, all of our lives have changed completely, but our desire to gather together in Tara's house hasn't. I am grateful for enduring friendships and the places that support them. Thank you, Tara, for making all of us at home! As a Montessori-trained mom, I value and try to foster O's growing independence. Our home environment is not as beautifully set up as many (such as this dreamy one, which makes me insanely jealous!) but it offers some tools for O to work on practical life skills (pouring, sweeping, dusting, cooking) and master the movements he needs to do everyday things by himself. I've been happy to be home with O for the past year and a half, creating learning and play spaces for his enjoyment, but as I take on more projects and find that I need to dedicate more time during daylight hours to my own work, I have been searching for another place he can learn - a place he and I will both love. Today, I think I found it. O and I took a tour of Heart and Hands Montessori, run by Susan Smith, a true kindred spirit of mine. She and I have exactly the same training (AMI Assistants to Infancy and Primary certificates from the same training centers) and many ideas and inspirations in common. The center will blend principles of the Resources for Infant Educarers model (RIE) and Montessori, which I've been doing at home, as well, and will offer full-day care with plenty of outdoor time and a calm, quiet, independence-oriented environment. I'll write more about Heart and Hands as it gets closer to opening next month, and especially if we end up being part of its community of families, which I hope we will. Susan's inspiration to create a beautiful, caring, special place - truly, a place to love - just for infants and toddlers in Boulder County fills me with joy, and I look forward to contributing to its success!